433 field trips have been completed in 36 districts of Nepal. These included family tracing, reconnections, reintegration, reunifications and monitoring. Found the families of 615 displaced children and reconnected them through facilitated communication and the visiting of communities by NGN staff. 244 trafficked and displaced children have been permanently reunified with their families. 33 youth have been supported through some or all of the following: support towards educational fees and material support at SLC, +2, diplomas or bachelor level; as well as one-to-one mentoring, shelter, food, medical costs and leisure costs. At least 6 diplomatic missions in Nepal have changed their travel advice to warn against orphanage voluntourism as a result of NGN advocacy. The US State Department updated their Trafficking in Persons Report (TIP Report) using NGN’s nomenclature to explain child trafficking and it’s source rooted in “Voluntourism”. 65 talks and events have been delivered to spread awareness of the dangers of orphanage voluntourism and our advocacy work has been covered in 103 media reports. 11 child friendly spaces supporting 1418 children have been established following the 2015 earthquake to protect the children against trafficking. 74816 vehicles have been stopped and searched in earthquake-affected areas, out of which 132 ‘at risk’ children have been intercepted and protected. Over 80,000 people have been reached in earthquake-affected areas to warn them about the dangers of trafficking and the importance of family preservation. Post-earthquake monitoring of 132 rescued children who were returned to their families to review their current situation. 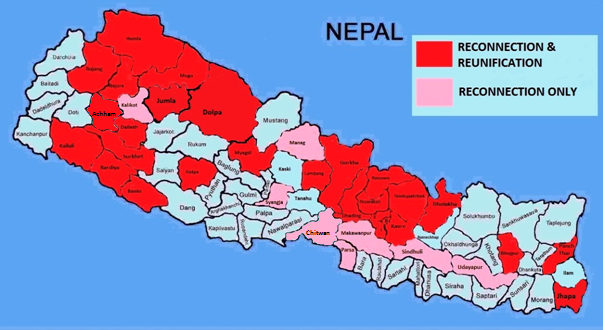 945,446 people reached through NGN’s radio ad educating rural Nepalis about trafficking.